It is time for the weekend and time for the fights you need to plan your social schedule around for August 4th and 5th! The Two time Olympian Claressa Shields looks to win her first world title against Nikki Adler. Shields who was interviewed here on FIGHT SPORTS wants to make a major impression in Detroit, just a few miles from her hometown of Flint. 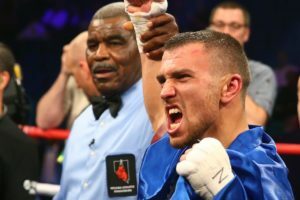 Shields has been in just four pro fights, but has impressed enough to battle the German born Adler for the WBC and IBF Super Middleweight Championships. This fight plus a super banthamweight card between Vladmir Tikhonov and Jesse Angel Fernandez will be televised, with the rest of the card only available for the audience in attendance at the MGM Grand Detroit. Rashad Evans faces off against Sam Alvey as part of a six match main card which will see the younger brother of Anthony Pettis, Sergio faces off against Brandon Moreno in a Flyweight division main event. The undefeated Lomachenko looks to stand out in his next defense as he faces Miguel Marriaga. Marriaga, coming off of a tough loss to Oscar Valdez is looking for redemption on the big stage. For coverage of these fights and everything combat sports, follow FIGHT SPORTS online, on Facebook, Twitter, and Instagram!